This week, a video of a kid swallowing a ghost pepper (and promptly screaming his face off) has gone viral, garnering almost 1.5 million views in the space of a few days. If the video teaches us anything, it’s this: The ghost pepper is not messing around. Also known as the “bhut jolokia,” the ghost pepper hails from northeastern India, and from 2007 to 2011 was ranked as the hottest pepper in the world by Guinness World Records. That title now sits with the Carolina Reaper, but the ghost pepper is still formidably hot. Heat in chili peppers is measured according to the Scoville scale, which measures their concentrations of capsaicin (the chemical which produces heat). The ghost pepper delivers over a million Scoville heat units, making it approximately 400 times hotter than Tabasco sauce. Despite (or perhaps because of) the ghost pepper’s searing heat, chili pepper lovers have embraced the pepper as a go-to ingredient for adding spiciness to food. The trick to making the ghost pepper edible is to use it in small amounts, very carefully. Keep reading for recipes that use the ghost pepper in ways that humans can actually eat. To be clear: The food that these recipes produce are still very, very hot, so if you’re not into intense spiciness, steer clear. 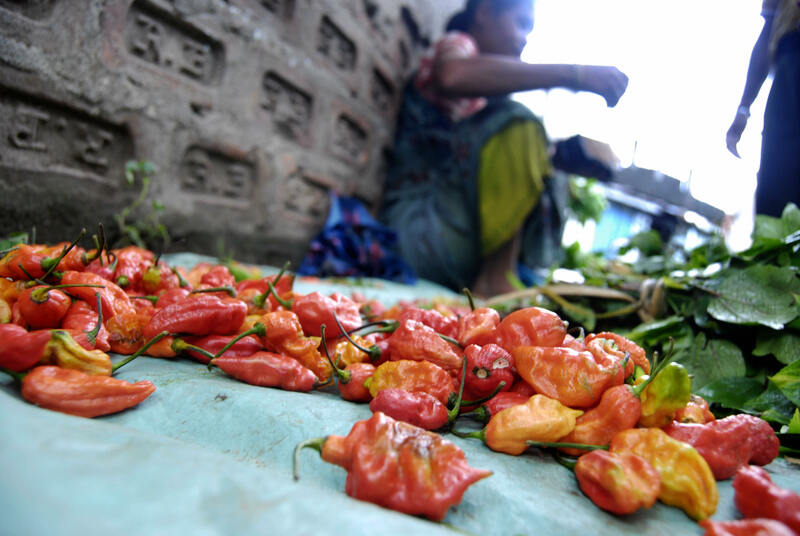 Ghost peppers are so hot that the Indian military announced plans in 2010 to use the peppers in “chili grenades” to combat terrorists. So, needless to say, you do not want this stuff to get on your skin or on delicate membranes like the inside of your nose or eyes. When you’re handling ghost peppers, wear gloves to protect your hands, and be careful not to touch your face or eyes. Wash your hands frequently and thoroughly, and clean your cooking equipment carefully. If you’re grinding the peppers in a food processor or blender, be careful to avoid inhaling any dust that may arise; it may be a good idea to wear goggles. 1. Wendy’s Jalapeño Fresco Spicy Chicken Sandwich and Ghost Pepper Fries, the Homemade edition. Josh at SkewToob demonstrates how to make ghost pepper jelly. His verdict: “It’s so hot, but it’s tasty.” Use this stuff to make the craziest PB&J sandwich ever. In January, fried chicken chain Popeye’s offered Ghost Pepper Chicken Wings. In this video, Hellthy Junk Food recreates the meal at home (with fewer than half the calories!). At the end of the video, our host eats a whole raw ghost pepper, makes himself very, very uncomfortable, and demonstrates once again why no one should eat whole, raw ghost peppers, ever. This simple recipe from Well Preserved shows you how to make salt infused with ghost peppers (or any kind of chili pepper). You can add this salt to any recipe to which you’d like to add a bit of a kick.